The Viaskin patch by DBV-Technologies – a simple solution to the thorny issue of allergies? Home to DBV-Technologies, the creator of a highly-promising new technique for food allergy treatment and diagnosis, http://www.dbv-technologies.com/en/ is a treasure-trove of information about a simple approach to an increasingly widespread problem. The Viaskin platform (click here for more details), is a kind of adhesive patch with a titanium backing covered with immunoactive compounds in powder form (see diagram below). 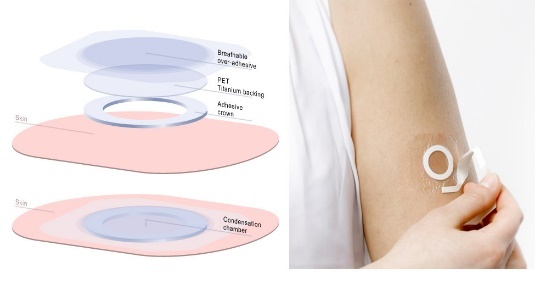 When placed on the arm, it hydrates the patient’s skin very effectively, causing an accumulation of water in a so-called ‘condensation chamber’, solubilizing the compounds, which can then enter the epidermis and subsequently, the Langerhans cells, which are highly-tolerogenic. This makes them ideal for the purposes of introducing antigens to the body with a view to ‘desensitizing’ it to these substances. The Viaskin patch is already being developed in several different versions: peanut, cows’ milk protein and egg – and there are plans for other variants too. The Viaskin patch could be especially useful for treating babies and children, as it’s entirely painless in application, unlike injections, and easy to administer, in contrast to some oral treatments. Vous voulez connaitre les coordonnées de l’agent MMA de votre commune ?